Sustainability and Skills Development are major global challenges that we are all facing. Working with industry, educationalists and researchers, we want to develop solutions to these challenges. We want to deliver impact. The GFOL-A will bring together stakeholders from the UK and ASEAN region to share knowledge and practice to address these challenges. In two countries, across four days, the Festival will showcase innovation, skills, and sustainability in areas such as robotic surgery, smart tourism, climate change, safeguarding world heritage sites, media, financial scamming, and HIV & AIDS prevention. 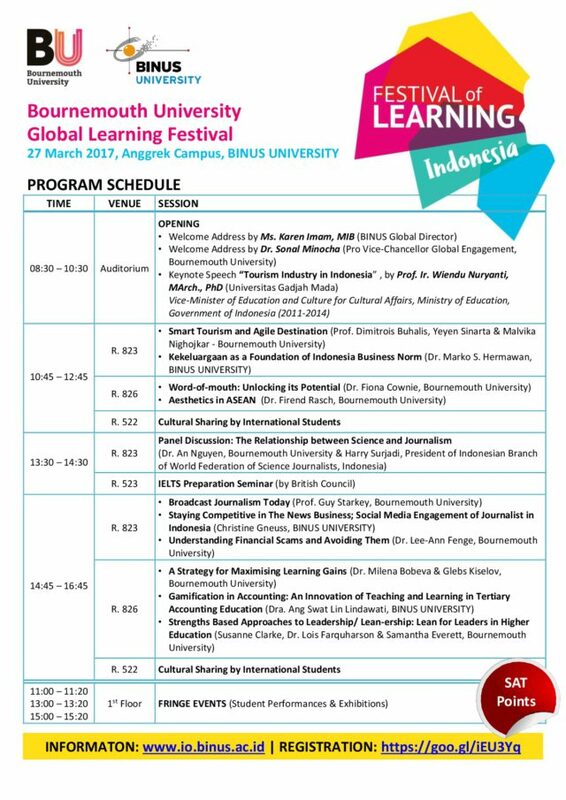 The Global Festival of Learning ASEAN is an international expression of Bournemouth University’s UK-based Festival of Learning that has held a variety of educational, cultural, and industrial events over the last five years. Our aim is to create a space to share ideas that inspire new thinking, and nurture creativity, innovation and social responsibility. For the GFOL-A, we work with partners and other collaborators in the ASEAN region to cocreate and disseminate cutting edge education, research and practice. If you are interested to attend any sessions, please register by click here. For more information, you can download the booklet here.